The PG&E bankruptcy is shaping up to be one of the biggest, lengthiest and most complex bankruptcy cases to ever pass through the American court system. And while much of the fate of the company rests in the hands of the judge and U.S. Trustees assigned to oversee the case, there are countless other power players who hold quite a bit of influence over the outcomes – not the least of whom are the state lawmakers in Sacramento, who have the ability to enact and reform laws that could be a benefit or detriment to more than 12,000 IBEW 1245-represented members at PG&E. These legislators are hearing a lot from the various parties who have a stake in the outcome, including hedge funds, lawyers, and other investors and creditors – and IBEW 1245 is ensuring that they hear directly from the utility’s own workers as well. 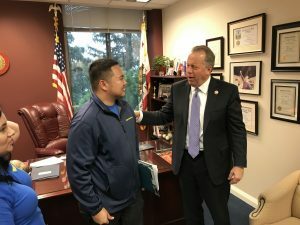 On March 5, a diverse group of IBEW 1245 members – including seven organizing stewards and nine members of Local 1245’s newly formed Emergency Response Team (ERT) – arrived at the state capitol, with the goal of meeting directly with every state legislator in PG&E’s service area to explain their perspective on the bankruptcy. Upon arrival, the group split up into smaller teams and set out on their mission. As they went from one legislative office to the next, they strived to underscore the importance of maintaining a skilled and trained utility workforce during and after bankruptcy, which is essential to energy reliability, safety of the energy and gas systems, consumer service, emergency response and wildfire reduction through hardening the system. The 1245 delegation urged legislators to take steps to ensure that the collective bargaining agreement with PG&E is maintained unadulterated post-bankruptcy, and that the pension is not harmed or altered. 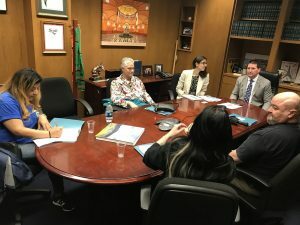 They also called on the legislators to address California’s outdated policy of applying strict liability or “inverse condemnation” on PG&E and other utilities, including both investor-owned companies and publicly owned agencies. As long as utilities are responsible for all fires caused by their infrastructure, regardless of negligence, they cannot achieve financial viability. This means PG&E will be unable to operate effectively, finance vital fire reduction and safety projects, or fund the work needed to meet California’s aggressive renewable energy goals. Local 1245 has been advocating for reform of this hazardous policy for quite some time and will not give up until the issue is addressed. The union members also helped the legislators understand the potential pitfalls of allowing communities to municipalize the utility infrastructure. IBEW 1245 maintains the position that municipalization is not financially plausible or legally viable, nor is it in the best interest of electric customers or workers, and should be dismissed. As they entered each legislative office, the members-turned-lobbyists worked to identify who among the legislators will stand up for the workers and the customers they serve during and after the bankruptcy. At the end of the day, they reported the majority of lawmakers were quite receptive to their message and willing to keep the union’s position in mind as things move forward.